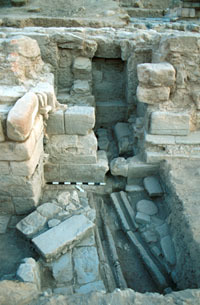 The large open area was long believed to be the site of a marketplace (the so-called "Lower Market"), but archaeological investigations in 1998 revealed the presence of a monumental swimming pool (43 x 23m and 2.5m deep) with an island-pavilion and an elaborate hydraulic system that fed the pool and also irrigated a large garden terrace (65 x 53m). The Petra garden must have appeared as a virtual oasis within the city. 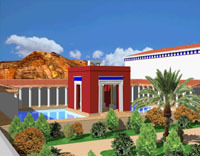 Artistic rendering of the pool complex based on the 1998 findings. Illustration by C. Kanellopoulos. 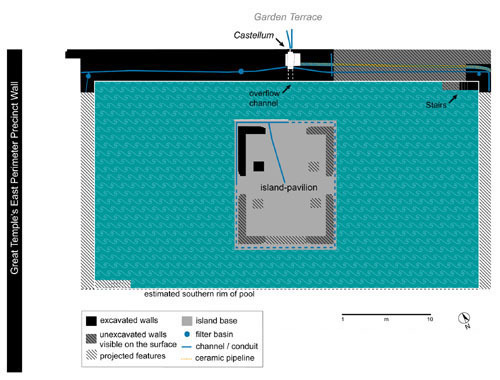 Schematic plan of the pool and hydraulic system with a detail of a water distribution tank or castellum (top).